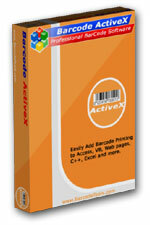 Simply insert the Bar Code ActiveX Control into your application and specify a few properties in the properties window and your desired bar codes will be generated automatically. Data Matrix, the public domain code from RVSI Acuity CiMatrix, is a 2D matrix symbology designed to pack a lot of information into a very small space. The Data Matrix symbology employs Reed-Solomon error correction with data redundancy to guarantee a fast and accurate read. The symbol can store between one and 3116 numeric or 2335 alphanumeric characters. 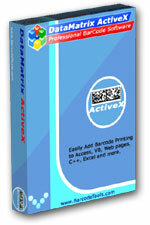 DataMatrix is one of the smallest and most dependable barcode symbologies. Compared to other barcode types, Data Matrix is approximately 30 times smaller than a Code 39 barcode representing the same data. Our DataMatrix ActiveX Control supports ECC-200 error correction. ECC200 is the newest and most standard version of data matrix error correction. It supports advanced encoding and error checking with Reed Solomon error correction algorithms. These algorithms allow the recognition of barcodes that are up to 60% damaged.